Grab that figurative grain of salt, and then throw it immediately away. Because while the rumor that Pixar has been assigned its own Star Wars movie is indeed only a rumor, it's frankly too perfect an idea to waste our time worrying whether or not it's true. Latino Review reported the "news," although anyone who remembers that Disney owns Star Wars, Disney owns Pixar, and Pixar makes good movies, could probably put all the facts together and come out with the same hypothesis. So let's all pretend it is true, and maybe we'll force Disney to conform reality to our wishes. 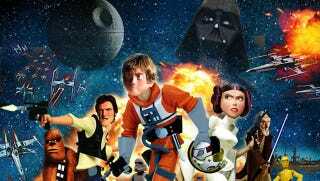 So what would be your first choice for Pixar's first jaunt a long, long time ago in a galaxy far, far away? That rumored Boba Fett solo movie? More Clone Wars? A feature-length version of the cartoon from the Star Wars Holiday Special? Let us know in the comments. Amazing Pixar/Star Wars art by Phil Postma.